I cannot remember the last time seeing the King and Queen cry in public... so sad. I feel so sorry for all Norwegians, the families, the friends... What a tragedy.. It is a shock for the peaceful nation like Norway, for everybody in the world as well. The Royal Family is there for the relatives of the victims, as well as the Prime minister. It shows how united the nation is. My prayers are with those who suffered the tragedy. RIP. I admire the fact that MM is so open with her grief. The most touching images to me are pics 3, 4, and 5. I admire how the couple are involving their children, giving them a lesson in grief, not shielding them from the sorrow, while still being there for them all the time. No, it was at the Norwegian Seamens church in Stockholm. I h.ave always admired and loved the NRF and now, more than ever I see them not only as royals, but also as people who have shared the grief of their nation openly. To see their tears and also to see them bringing their children to see and take part in their nation´s sorrow. They could have shielded them, but they prefered to have them understand how there are times of joy and pomp as well as times of grief and sorrow. May God bless Norway and give renewed strength and unity to its marvelous people. Haakon and Mette-Marit visiting the victims in Ringerike Hospital. "I think I speak on behalf of all of Norway when I say that we will stand together behind you," says Crown Princess Mette-Marit. As a Norwegian these past days have been utterly shocking and terrible. I’ve been glued to the TV and laptop ever since the news first reported of the explosion and then the island shooting following. This is just a completely harrowing and so difficult to grasp. I am very proud of how the nation’s leaders have handled the situation and it’s been so heartening to see members of the Royal Family. It is in the aftermath of these attacks we will show our self and others that we will stand together. I’ve seem four wonderful quotes used in reference to these attacks in the last days and I think they all say much about how Norwegians will look at this. “Freedom is stronger than fear”, taken from the King’s speech to the people. “No one will not bomb us to silence. No one will not shoot us to silence. No one will ever stop us from being Norway”, taken from the Prime Minister’s first speech to the people. “If one man can show this much hate think how much love we can show together”, a survivor, Stine Renate Håheim to CNN. “We are so few in our country, every fallen is a brother and friend”, from a poem by Nordahl Grieg. Monday at noon, local time, Norway and Sweden will have one minute national silence. Some links to videos and pictures with the royal family. Some more links, I'm sorry if some of the have already been posted. http://www.tv2.no/nyheter/innenriks/...g-3545194.html The whole service at Oslo Cathedral can be seen here. - Jeg satte stor pris på besøket - Nyheter - Innenriks - Aftenposten.no A young survivor sying he appreciated the Crown Prince and Crown Princess coming to talk to him and others. Kongefamilien tente lys for ofrene - Norge - NRK Nyheter (Crown Prince Family and Queen, looking at messages, candles and flowers people have put down in Oslo). We feel for you Norvegian people ! Hi, her majesty, the last time that i remember that the king cried in public was when king olav dead. I think so. I think Fortimo is referring to the recent terrorist attack in Norway. 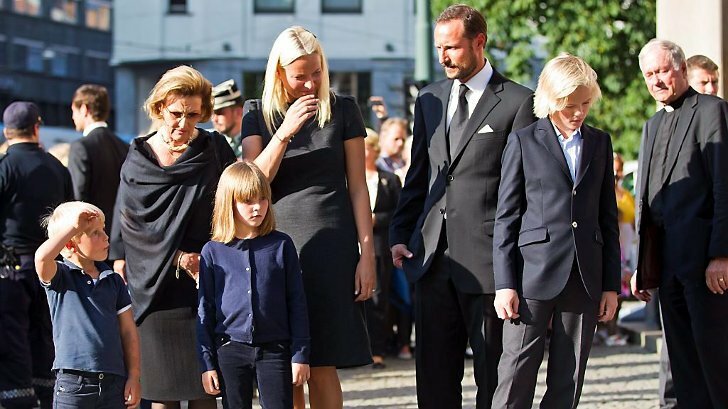 And I agree with her that it's unseemly to discuss something as trivial as Mette-Marit's hair at a time like this. We in the United States have felt the pain of the killing our innocent people. We feel your pain, and we grieve with you as you grieved for us in our times of national tragedies. May God be merciful to you and to your victims.